Which gun safe brands can you depend on? You’ve probably seen a lot of guides for specific gun safes, but what about the brands, and how do you know which ones are the most reliable? That’s what this guide is for, to give you info about these manufacturers. All companies say they are the top gun safe brand, but only a handful are actually worthy of that title. Any company with sufficient funds can slap together a safe, but only the most reliable companies can manufacture safes to meet the needs of different users. In the following sections, we’re going to take a closer look at the leading brands and how they stack up, the advantages, drawbacks, company info and so on. We’ll also review one product each to show you what each manufacturer has to offer. AmazonBasics is not yet as well-known as other gun safe makers, but they’re catching up fast. This company was created by the online retail giant and offers a wide range of consumer products such as cables, computer accessories, and gun safes. AmazonBasics is aimed at mostly budget users looking for reliable products at less the cost of more popular brands. However, you must not equate “affordable” with “cheap”, as there is nothing cheap about their gun safes. This gun safe has interior dimensions of 13.5 x 8.75 x 9.5 inches and offers sufficient room for your valuables. For security, the safe has a digital electronic lock and a couple of override keys for emergency use. The safe is made of solid steel, and the hinges are concealed to prevent prying. A couple of live doors bolts are installed for additional protection. The safe isn’t water or fire proof, but it is solidly made. A look inside also shows there is a removable/adjustable shelf so you can arrange the items as you like. 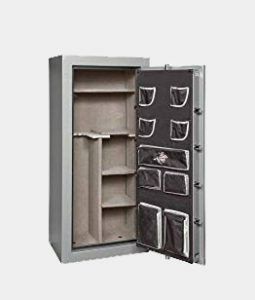 AmazonBasics is new to the gun safe industry, but they’ve got a good range of products to choose from and at affordable prices. We can’t talk about the top gun safe manufacturers without mentioning Barska, as their products are known for dependability. The manufacturer is recognized for sports optics mainly, but their security solutions are excellent. Their biometric safes are durable, easy to access and suitable for home and office use. Since they’re biometric, you just need to press the scanner to gain access. The Barska biometric safe epitomizes the best that fingerprint has to offer. With its scanner you can record up to 30 fingerprints for easy access. Apart from the safe, the package includes a couple of emergency backup keys, mounting hardware and four AA batteries to power it. The biggest advantage of these biometric safes is you’re able to access your valuables and weapons quickly. In a case of an emergency, you may have trouble remembering the combination, but with a biometric safe you just press your finger. Besides the convenient access, there is a two-point deadbolt locking system installed for security. The interior of the safe is padded to provide a cushion for the items you store. If you look up customer reviews for Barska safes, you’ll see that they get good feedback, and it’s indicative of their high standards. For more than 30 years, Fort Knox has been recognized as one of the best gun safe brands today. The company is well-known for its large vaults that provide optimum fire protection, but they also make small safes for handguns. Fort Knox makes a number of different vaults including custom interiors while using industry leading steel. The same technology used for their large vaults are also now being applied to their shotgun and pistol safes. The FTK-PB comes with a compression gas strut which assists in opening the safe. The safe itself measures 12.5 x 10.8 x 4.2 inches and exceeds the standard set by the CA Firearms Safety Device Requirements. The safe uses a mechanical lock for security, and there are 1081 possible combinations. The lock, like those in other Fort Knox safes, is built for rugged use and don’t need any batteries. The FTK-PB is a no frill safe and works without any problems. Lastly, there is sufficient room here for two 9 mm pistols and extra magazines and optic equipment. The name Fort Knox is highly regarded in the industry, and it’s a well-deserved reputation as their safes are dependable and well-built. Gun Vault has consistently been one of the top gun safe brands for the past 25 years, and they’re well known for developing innovative technological security solutions. Their Bio pad and No-Eyes keypad provide easy access to your gun even in darkness. Gun Vault also uses biometric technology and have created the proprietary finger pad sequence for extra security. The company has manufactured a wide range of safes including the BioVault, Multi and Mini Vaults. 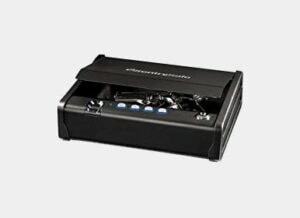 The SV500 is a uniquely designed gun safe, compact and can be attached under your desk for instant retrieval. The digital keypad provides quick access and it uses Gun Vault’s durable lock mechanism. 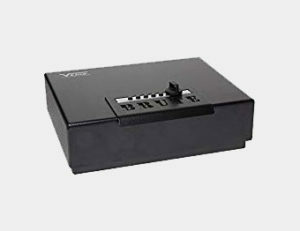 The SV500 comes with a backup override key so you’ll be able to access the safe anytime. 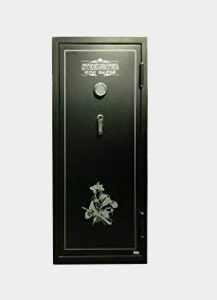 The safe is constructed of 18 gauge steel for extra durability, a trademark of Gun Vault products. The SV500 is best mounted, and all the mounting hardware is included. A look at the interior also shows the SV500 has some foam padding for your gun. Gun Vault is a known brand and offers plenty of options for the weapon owner, and their products are high quality and designed to last. Honeywell manufactures a wide array of consumer and commercial products including turbochargers, thermostats, and dehumidifiers. However, their safes are also comparable to the best home gun safe brands in the world. Honeywell was founded 110 years ago and have manufactured various security solutions since. 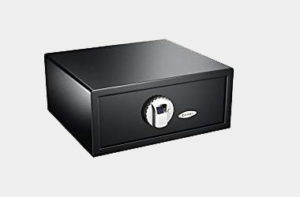 These include steel / fire safes, security safes, cash safes and steel security safes. The Honeywell 1104 provides protection against 1700 F fire for an hour, and it has a waterproof seal for up to 48 hours. The safe has .38 cubic feet of space, and it’s designed mainly for A4 and 8 ½ x 11-inch documents. While it is meant for documents, there is room for storing other valuables, digital media, etc. The safe weighs 56 lbs. And comes with a handle so you can carry it easily. Like other Honeywell safes, the 1104 has a 7-year warranty, the best in the industry. The 1104 Honeywell is one of many in the Fire / Water Chest series, and they share many features like those mentioned here. Honeywell is an established name, and through the years have maintained their reputation. If you’re looking for quality safes, this is a brand name you can depend on. 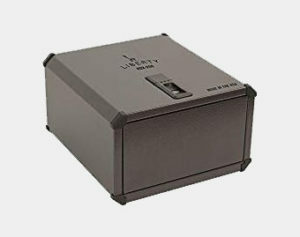 When we compare gun safe brands, the name Liberty is another one that comes up, as the company offers over 30 unique gun, security and home safes in various colors and styles. Each of their safes has a lifetime warranty, and if your home catches fire or gets broken in, your Liberty safe will be replaced free. There are more than 2 million homeowners who use Liberty safes, proof of their reliability. This safe is built to secure your handgun or valuables, and it relies on their 5th generation Biometric Technology for quick access. When attached to the bundled AC adapter, the safe opens in one second. The Smart Vault series recognize up to 15 unique fingerprints, and once registered, just swipe your finger and the safe opens. For extra security, you can mount the safe with a mounting bracket (optional). The Smart Vault safes have a 14 gauge steel door with a fortified latch system and anti-pry tabs. With these features, it’s going to be very difficult for burglars to try and break into the safe. Other notable features on these safes are interior lighting, backup key and auto opening door. Liberty safes are high quality and worth buying for home use, and the warranty coverage is very good. The Sentry Safe brand, made by the Master Lock Company, has been making safes for over 80 years. Their safes are best known for security and fire protection, but they also have products for cash, home defense, portable security and more. Their safes come in different forms with some for long arms and others for pistols. Their main product line includes a wide assortment of chests and fire resistant safes in various capacities. 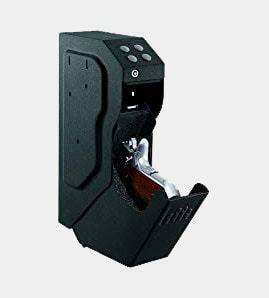 The Biometric Sentry Safe has enough space for full size handguns or an assortment of valuables, and no matter what you put inside it the biometric controls ensure quick access. The safe comes with a pry resistant lid and convenient single handed access. Furthermore, the hardware is quiet so you can access the safe without alerting the burglars. 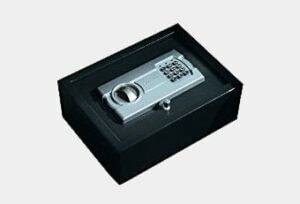 The safe is made of solid 12 gauge steel, and the digital keypad is easily programmed. Once you have set the code, the gas compression strut keeps the gun safe so you can retrieve the weapon or the valuables inside. A lot of gun safe companies have come and gone, but Sentry Safe remains. If you look at customer reviews for their safes, they receive mostly high ratings, and they’re a good choice for most people. Stack-On manufactures several security storage solutions, many of which have found their way in American homes. Among the most popular are the Elite, Buck Commander, and their personal safes. The company has earned a reputation for quality, and their products are recognized for their anti-theft and general high quality build. They also manufacture accessories and related security products which have also received positive feedback. 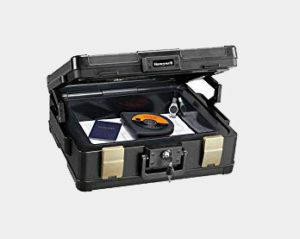 The PDS-500 is an all-around safe for guns and valuables, and they’re versatile enough to be used in the home or office. 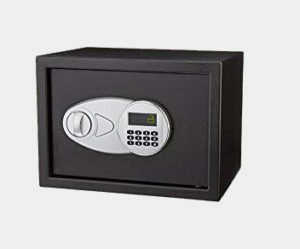 These safes also use the latest digital electronic locks for security and easy programming. These safes are made of solid, heavy duty materials, concealed hinges, live action locking bolts and pry-resistant steel doors. Another nice feature on these safes is the lockout which activates after three failed attempts. These drawer safes are programmable, and you can put it in silent mode. Like any good safe you can mount this to the floor. With dual access and backup keys included, your gun is never too far away. Stack-On is a reliable brand and offers different types of high-quality safes suitable for home and commercial use. Steel Water is one of the most popular gun safe brands in the US, and for many years has been regarded as among the industry leaders. Steel Water makes small home and office gun safes too, but they’re best known for their long gun vaults. Their long gun safes have different features, but they’re all built with security foremost in mind. These safes have fire protection, drill resistant components and use heavy duty steel and direct drive linkage systems. This Steel Water safe offers 45 minute fire protection up to 1550 F, and there is room here for 12 to 16 long guns. The lock uses an EMP resistant electronic lock mechanism, and it also has a backup key for emergency access. The safe weighs 425 lbs. and you can anchor the safe with its ¼ inch steel bolts for added security. The safe drill plate covers 8 times more area than those on regular safes, and its gear drive system makes prying difficult. The safe has a 4 ¾ inch thick door, 3 hinge bolts and half a dozen chrome plated bolts, and there’s a relocking bolt too. If you’re looking for a secure safe for your long guns, Steel Water should be one of the brands to consider. V-Line is has developed a reputation as one of the good gun safe brands, thanks to quick access safes and other security solutions. These safes are designed for guns, but can be used to store gadgets, jewelry, and other valuables. V-Line makes heavy duty safes, security cases and compact gun safes for use in the home, office or for carrying in a vehicle. The Brute Heavy Duty Safe is made of 10 gauge steel and has a reinforced anti-pry design. The safe uses a keyless lock for quick access, and opening is gas assisted for your convenience. The lid has an overlapping design, making it difficult to pry when bolted. It has black powder coating for a superior finish, a 12 gauge steel handle, and extra-large dead bolt. Other features on the Brute Heavy Duty Safe are customizable interior foam, welded pin and a reinforced continuous hinge. There are also four holes so you can mount the safe, and there’s a heavy duty mechanical lock. The safe weighs 22 lbs. and doesn’t have any noticeable welds or faults. Finally, the safe doesn’t need any batteries to operate. V-Line has managed to stay around for two decades because of their quality safes, and it’s a name you can depend on. No list of gun safe manufacturers would be complete without Winchester, as it has become a legend in the field. The company has been in the firearms and safes business for over 150 years and many gun buffs, they’re the only name that counts. Several types of Winchester safes are available, and they’ve all been rigorously tested for burglary protection. All theirs safes moreover, have UL listing for safety, security, and exceed the California DOJ requirements. The Ranger safes are built from 12 gauge steel and offers up to 1 hour fire protection @ 1400 F. The Ranger safes also have drill proof hard plates and 1.25” locking bolts for extra protection. The safe incorporates a 4-way locking bolt system, three spoke vault, two-layer fireboard body, and three-layer fireboard door. The safe interior dimensions of 56″ (H) x 25″ (W) x 14″ (D) and can fit up to two dozen guns. Winchester has been around since 1866 and has stood the test of time. Their safes are known primarily for firearms protection, but you can use these to safeguard anything of value. A good list of gun safe manufacturers tells you the benefits they can provide. Though the advantages can vary, they do share common elements. 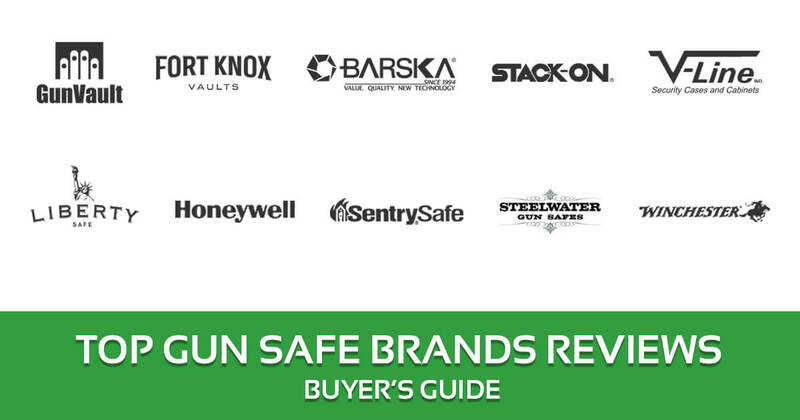 Trusted Names: the best home safe brands have earned that reputation by manufacturing high quality gun safes. From protecting your kids and deterring robbers, you cannot settle for second best. Dependable Customer Support: if something goes wrong with the gun safe, you need someone to talk to. The top rated gun safe brands offer you reliable customer support. Lots of Options: do you prefer biometric safes over manual combination locks? Whatever your choice is, the top gun safe brands have a model that suits your needs. Easy to Use: the top gun safe manufacturers make certain their products are easy to operate. While your gun and valuables are secure, you can quickly access it. Excellent Warranty Coverage: gun safes made by leading brands provide good coverage. Hard to break-in: these guns safes are built to withstand vandalism attempts. But apart from these, gun safes made by the leading manufacturers balance features with ease of use. Even though features get upgraded, they have fail safe elements so you don’t get locked out. The top gun safes do more than just keep your firearm secure. They’re also a good place to store valuable items like jewelry, money, documents and so on. These gun safes are often fire and water resistant. In the event that something untoward happens to your home, your gun and valuables are protected. The answer to the question what is the best gun safe brand will vary depending whom you ask. But what everyone agrees on is all gun safes need maintenance. Even though gun safes are built to last, you have to do your part in maintaining them. The good news is you don’t have to do a lot to keep a gun safe in good condition. 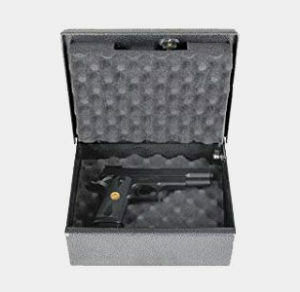 Read the best brand gun safe reviews and the product description for specific instructions for cleaning and maintenance. Wipe the gun safe with a clean cloth regularly to prevent dirt buildup. This is likely to happen if the unit is stored in a hidden area. Use only soft, non-abrasive materials when cleaning the cloth. Do not use rough materials as it could damage the finish. Do not use harsh chemicals or cleaning detergents. They’re not necessary to remove dirt and could just damage the finish. If dirt refuses to come off, dampen the cloth with water. Wipe the surface until dirt is removed. Usually that’s enough to remove dirt. But if it is not, you may use soapy water. This might prove useful when cleaning areas like the hinges, locking bolts and handle. Some gun safes may need oiling for the hinges. However this is usually not necessary with newer models as they’re quiet. Be careful when using metal cleaners. While they can be helpful, it could also damage the surface. Keep these up and your gun safe will last a long time. Steelwater gun safe vs Liberty. Which is better? Both make quality safes for pistols and long firearms. Just like with any other product, it’s the features you want that determine which gun safe is the best. How do I access safes if the battery goes dead or I forget the combination? These batteries have a backup key. Keep the key(s) in a safe location so you can open the safe in case of an emergency. Do all gun safes come with pre-drilled holes? Most gun safes have pre-drilled holes, but not all of them. But even those safes that don’t have holes mark the areas so you can drill them. How long is the warranty for gun safes? Most offer a lifetime warranty, but others are good only for a few years. There may also be a separate – usually shorter – warranty for the gun safe’s electronic components. Other safes however, will replace your safe if it’s damaged or burns in a fire. All the 11 brands I have reviewed here are well-known and have a loyal following. They’ve been in the industry for years – decades or longer – and it’s a testament to their quality products. But we have to pick a winner among the group, and it is Winchester. Their safes are known for durability and offer lifetime warranties for burglary and fire, testament to their quality. The other manufacturers have excellent products too, but when it comes to the gun safe Brands, the name Winchester stands out from the rest. The 11 gun safes recommended happens to be some of the best brands I have noticed in the market though I expected more omitted designs here.Nevertheless, the author did a wonderful task of printing my best brand the Fort Knox Gun Safe which I ordered for delivery from Amazon. It is made of quality materials and is manufactured right here in the USA.